The entrance to Bowers Rock State Park at the end of Bryant Drive. The public does have the right to access Bowers Rock State Park via Bryant Way, according to the Oregon Department of Parks and Recreation. There follows a lengthy legal description. The document makes clear that this right of ingress and egress stayed with the properties’ subsequent owners “forever.” It was this right, or easement, that passed to the state when it acquired the properties to which it is attached. Thank You Hasso for the great follow-up story. By you looking into the record books I´d think all are thankful for having you (and your bike) here in Albany. Hasso, I believe the public may park along the county right of way along Bryant drive. As long as you do not block or impede traffic. However, I have not looked up the county laws in this regard. “L’etat c’est moi”? I feel so much better. So, do you claim to be the progeny of Louis XIV? Or are you just trying to confuse people? There is some doubt that Louis XIV ever said that. Doesn’t impact my life currently. Not that I am aware of. I suggest we meet at Bryant. Park that is and take to the river. It can be a day-outing. of fun, exploration, lively conversation and a brainstorming session on what to do with this park. Who is in? No shotguns or bow & arrows allowed. Conventional proposal: Build a big parking lot and the usual “facilities.” Pave Bryant Way to placate the neighbors because cars kick up a lot of dust. Think outside the box: Build a bicycle bridge from Hyak Park to Bowers Rock and paths from the bridge to Bryant Way. No need to pave anything. 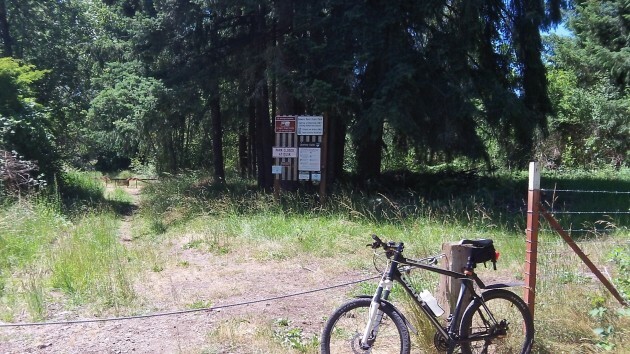 You now have a bicycle route between Albany and Corvallis which bypasses the most suicidal part of Hwy 20 (east of Hyak Park). Until we have “like” buttons here, I’ll offer a reply post. Placating the neighbors. I like it. This is very important!! They are feeling encroached upon. To make them feel at ease with so sort of offering is important. Less dust, perhaps. Bicycle bridge…cool. Not sure anything would be less suicidal as bike vs. auto. Train? Sorry we’ve seen that. Good info Hasso, probably does not make you real popular with the neighbors though. If you research easement law in the State of Oregon, I doubt you will find a case that supports your theory that millions of people can use that easement to access the property. I think the state parks is blowing smoke when they say millions of people can access that property based on the easement. You are dead wrong. Whoever has an easement can use it at will. If I want my 3.5 million relatives to come to my house there is NOTHING you can do about it. You are dead wrong Bob. Don’t ever go to court over an easement expecting that result because you are wrong as I found out in losing a court case. Just ask Jim Delapoer my attorney.